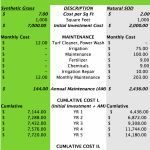 Lawn Kings – Synthetic Turf Maintenance & Care - Lawn Kings Inc. Lawn Kings synthetic grass requires very little maintenance. With just a few products and a little labor you can keep your turf looking fantastic for years. An occasional flush with the water hose is usually sufficient to remove dust and pollen. For leaves, twigs, and other items a leaf blower is an excellent option. A household or shop broom can be used or a professional turf care product like the Grandi Groom. When it rains it’s nature way of cleaning your synthetic grass. As you might expect it’s best to clean spills as soon as possible. The clean up is easier before whatever was spilled has dried and hardened. Clean up the affected area of any solid or paste-like deposits with a spatula or table knife and then blot up excess liquids with paper towels, a clean cloth, or a dry absorbent, we recommend our Superfill Infill or the Zeolite Infill which like kitty liter is specifically made to absorb moisture and prevent odors. Once the liquid is absorbed it can be vacuumed up. Quality Lawn Kings synthetic grass fibers are resistant to staining and are generally durable and so clean up is typically easy. Yet some cleaning products are not recommended to apply to the entire synthetic grass surface. In other words, some cleaners, typically for oil-based stains, should be utilized for spot cleaning only. The proper method would be to apply the product to a rag or cloth first and then gently scrub on the blades and they with a clean rag or cloth remove any remaining cleaning product and stain. WARNING: Mineral spirits and other petroleum-based solvents are flammable. DO NOT smoke or permit open flames near where these are being used. Also, be sure the area is well ventilated where solvent cleaners are used. In high traffic areas fibers may lay over or mat down and if there is build-up of dirt and uncleaned stains. The solution is to brush up against the grain or forward orientation of the turf fibers. Doing this as needed or periodically essentially “fluffs-up” the fibers to restore natural “freshly” groomed look. Never use a brush with metal or wire bristles as these can damage the taller fibers. Lawn Kings synthetic grass is manufactured with tough and durable fibers, but some precautions should be taken to prevent damage to the synthetic grass. Artificial grass is flame retardant, so it won’t ignite but it can melt and burn! Cigarettes, fireworks, and open flames should be kept away from the grass. Furniture and equipment with sharp or jagged edges should not be placed on turf as this may cause punctures or tears. Never leave a parked vehicle idling on the grass. Cap off or remove nearby sprinkler heads to avoid mineral or hard water deposits from staining the synthetic grass. Make sure the artificial grass is not exposed to reflective sunlight windows as this may fuse the turf fibers together by burning or melting them. 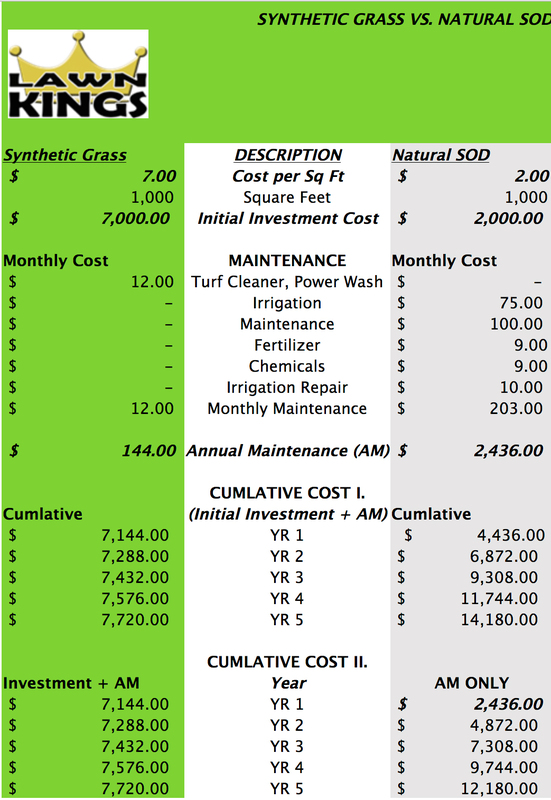 CONTACT US ANYTIME WITH ANY QUESTIONS ABOUT LAWN KINGS SYNTHETIC GRASS! LAWN KINGS is located at 29021 Avenue Sherman #107, Valencia, CA 91355. Stop on by or call us at (661) 310-9375 or by email LAWNKINGSINC@gmail.com . Visit our web page at: www.LAWNKINGSINC.com .